Ruidoso cabins that will make you want to hibernate — DiscoverRUIDOSO.com | Plan your Ruidoso getaway here! Warning: This adorable little cabin might make you want to go off-grid. Indefinitely. Relax in comfort in this cozy little cabin with custom rustic décor, a fireside love seat, and a great side porch for taking in the mountain air. A cozy wood burning fireplace greets you after your sleigh ride thru Upper Canyon during the Holidays. A perfect cabin to rent in Ruidoso for your next romantic getaway for two. Flatscreen TV swivels above fireplace for viewing from living area, bedroom or the whirlpool. 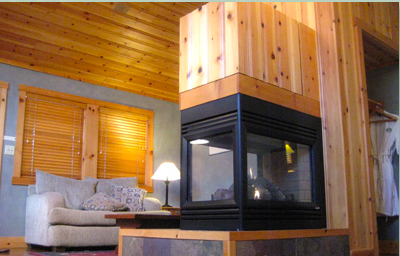 With a see-thru fireplace and private whirlpool just steps from the Rio Ruidoso. this Upper Canyon cabin has a tranquil walking path, and mallard ducks that have taken up residence in the river. It’s also a favorite spot for New Mexico Fish & Game to stock the river with rainbow trout. Spend time enjoying the views from the deck. Grill outside and then head for the hot tub. Rustic and welcoming, this luxury mountain cabin is a scenic spot to call home during your time in Ruidoso. Spacious and comfortable with a gourmet kitchen and games room with pool table, this 2-bedroom vacation rental is a perfect escape for friends and family. Cute little log cabins offering low rates, fireplaces, kitchens or kitchenettes in a woodsy escape with barbecues and a playground for the kids. Better yet, you’re only two blocks from the shopping and dining in Midtown Ruidoso. Fun Fact: Did you know that Ruidoso is rated as one of America’s top ten vacation rental destinations?